Built right across Superior Street from the American Exchange Bank building, the massive brick six-story Duluth National Bank building was another fine example of the Romanesque Revival style, but it featured more decorative details than the Exchange. Its first floor featured an arched entrance with carved columns of Fond du Lac sandstone and a splendid square corner tower with turrets. The letters “DNB” were placed vertically on the front façade of the second through fourth stories. The bank had been organized in 1882 with Luther Mendenhall as president and a financial stake of $150,000, unusually high for its day. Albert L. Ordean took the helm when the bank moved into this building. In February 1888, Duluth National merged with Union National Bank less than a year after opening the building, becoming the Duluth Union National Bank (and rendering the letters on the building obsolete). A year later the Duluth Union National merged with the Merchants National to become the First National Bank of Duluth. In 1929, a short time before the stock market crashed, First National merged with American Exchange Bank to become First American National Bank. The new bank conducted business in this building until 1957 when it moved to a new building on the site of the Exchange Bank. 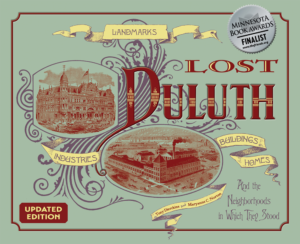 The Duluth Bank was demolished in 1958 for a parking lot. In 1977 the Normandy Mall, later renamed the Holiday Center, was built over the former footprint of the Duluth National Bank and other buildings.